Artist Dan Hernandez has an absolutely awesome new show up in New York City at the Kim Foster Gallery. 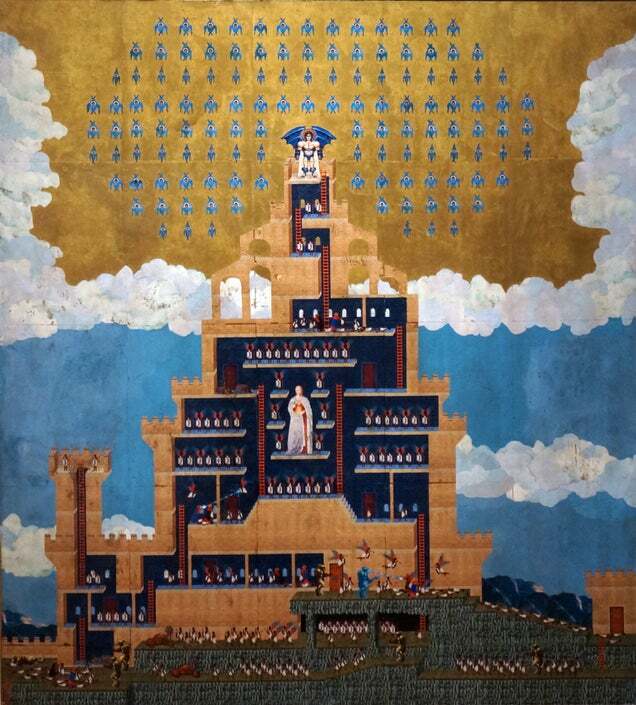 combining Renaissance theology with the iconography of early computer game art, or Space Invaders meets the Book of Genesis. 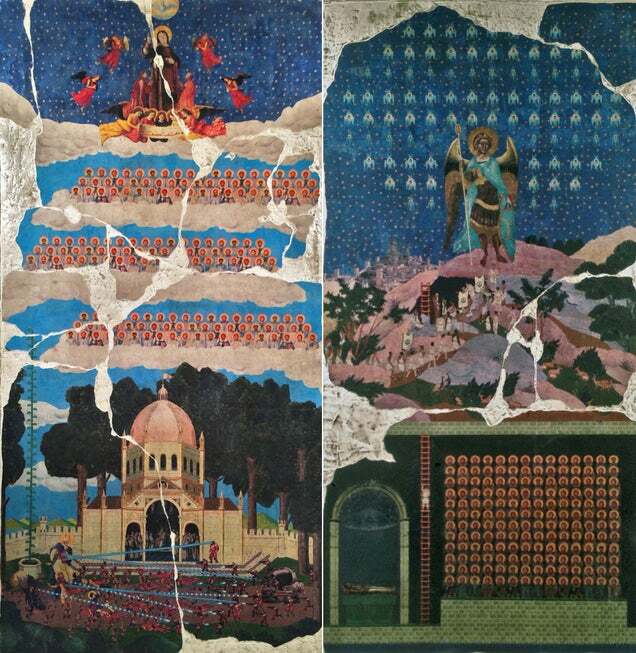 The gallery itself elaborates, writing that "the exhibit's title 'Genesis 2014' refers to the artist's on-going visual dialogue of religion, mythology, and pop culture. Hernandez blurs boundaries, rearranges hierarchies, and calls into question our notions of iconography, collectibles, violence and devotion. The title not only references the biblical Book of Genesis, but also the video game console Sega Genesis that was a defining moment in pop culture, especially for those in the artist's generation. The Book of Genesis houses the creation stories: Noah's Ark, Adam & Eve, etc. Similarly, the Sega Genesis was a vehicle for narrative video games like Golden Axe, Streets of Rage, Altered Beast and others. Both have narratives that utilise the supernatural and mythical as a central and reoccurring theme. By embracing such eccentric comparisons, the artist explores the unique and interesting artistic possibilities that exist." Infinite scrolling skies stacked with palaces await the soul of an earnest gamer, as floating castles and platforms hover overhead in elaborate off-world levels of a divine invasion. A phalanx of angels quietly assembles inside a blinding cloud of golden light, ready to send thunderbolts—or weaponised blessings—our way. Infernal rumblings in a world of darkness and linked ladders indicate new depths to which this unholy action will take us. The devil himself comes armed with fire and electricity to wage arcane war against birds and shepherds. 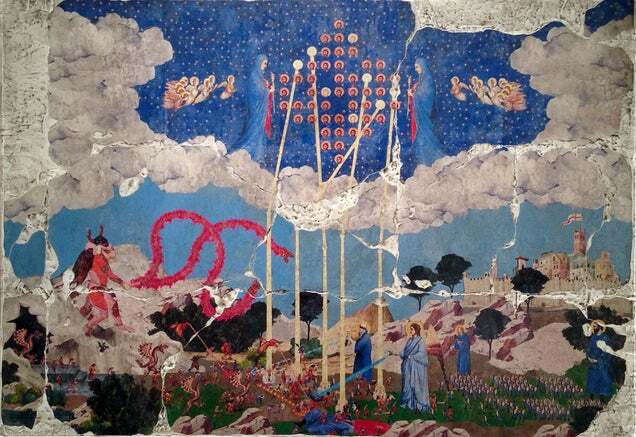 (left) Dan Hernandez, "Massacre at Intelari Chapel," 2014. Mixed media, 48 x 24 inches. (right) Dan Hernandez, "Tomb of San Sagatarido," 2014. Mixed media, 48 x 24 inches. Courtesy of Kim Foster Gallery. 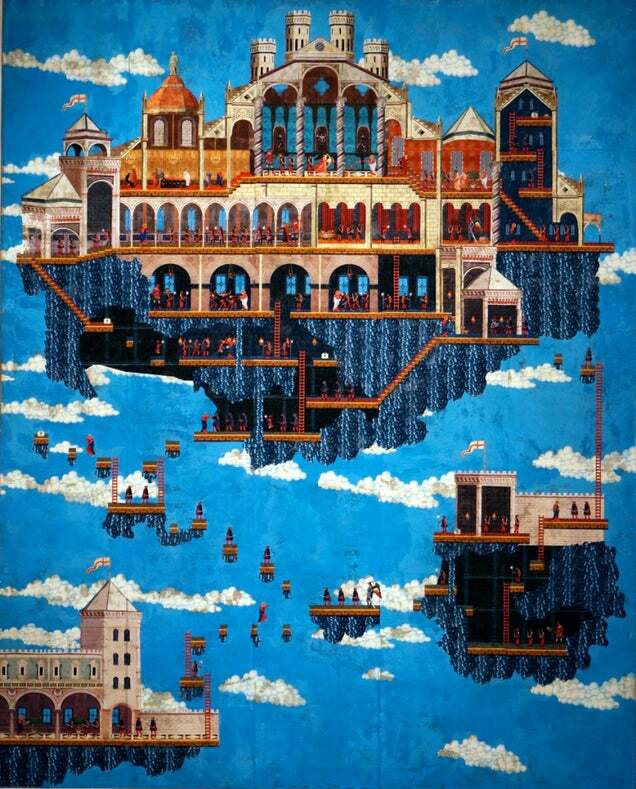 Lead image: Cropped from Dan Hernandez, "Siege of Intelari Stronghold," 2013. Mixed media on panel, 44 x 40 inches. Courtesy Kim Foster Gallery.